Daniel-Benneworth Gray picks a cover design which in less skilled hands might have been far too clichéd, but with the dream team of Mike Mignola and Paul Buckley in charge, really hits the spot. What is it about Mike Mignola’s black? It seems blacker than other blacks. Deeper, darker, inkier. It drags you into a version of the world in which shadow is the natural state of things; light is merely something that happens in the in-between. His black seeps into everything, and yet it is never murky — it is a solid, angular, crisp black. Where colour does escape, it tentatively peeks from the darkness; it’s bright and bold, but only ever a step or two away from receding back into the darkness. 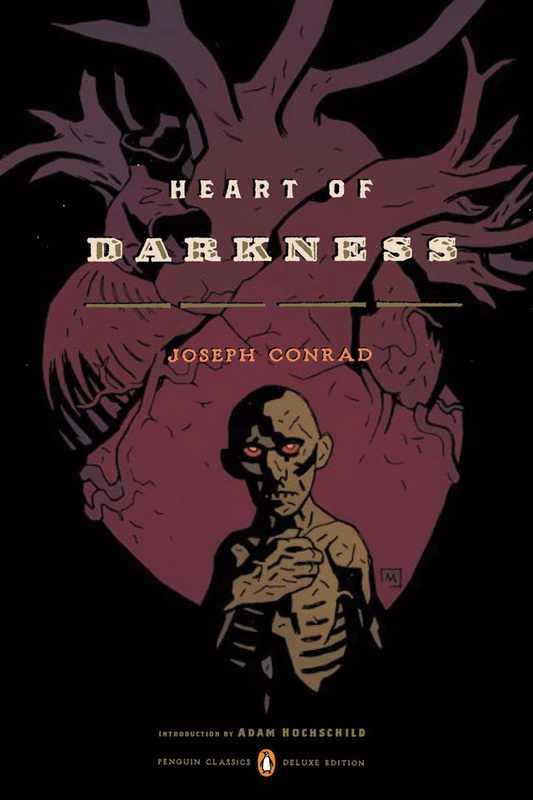 In 2012, Mignola put that wonderful black to good use on Penguin Classic’s deluxe edition of Joseph Conrad’s Heart of Darkness (designed by creative director Paul Buckley). Having spent a career illustrating those that lurk in the shadows — Batman, Dracula, Aliens, Spawn, and of course Hellboy — it makes sense that Mr Kurtz would eventually land at his door. Who else could illustrate that but Mignola? It seems preposterous that other editions have ever existed. Elsewhere in the story, protagonist Charles Marlow catches a glimpse of a painting by Kurtz: “I noticed a small sketch in oils, on a panel, representing a woman, draped and blindfolded, carrying a lighted torch. The background was sombre — almost black. The movement of the woman was stately, and the effect of the torchlight on the face was sinister.” Sounds rather familiar, no? This is one of those covers that seeps into the text, becomes one with it. Design, character and story are entwined. It’s a story of shadows, wrapped in shadows. Still, maybe there’s room for improvement. Earlier this year, as he finally brought the Hellboy saga to a close, Mignola said that he wanted to concentrate on painting, and explore different mediums. Meanwhile, Anish Kapoor acquired the exclusive rights to the blackest black in the world. Vantablack, made from carbon nanotubes and bits of science, reflects almost no light at all – it is less a pigment, more a complete emptiness. No matter what surface or shape it covers, it looks like a hole in space. A heart of darkness. Can somebody just put Mignola and Kapoor and Buckley in a room together already? See more of Mike Mignola's work here, and Daniel Benneworth-Gray's here. …is a book designer based in York. He also writes a regular column about freelance life for Creative Review and edits Meanwhile, an email about books and design. Daniel is currently attempting to design new covers for one hundred of David Bowie’s favourite books. He doesn’t know why. …follows the journey of the book's narrator Marlow up the Congo River in Congo Free State, Africa. Based on Conrad's own experiences, the book has had a number of different adaptations over the years, including a radio play by Orson Welles, however the most notable was Francis Ford Coppola's 1979 film Apocalypse Now. The location was swapped for Vietnam and Cambodia during the Vietnam War and the two main characters played by Martin Sheen and Marlon Brando. The film's production was fraught with difficulties, which were subsequently documented in the fascinating 1991 film Hearts of Darkness: a Filmmaker's Apocalypse.